Jessica Carter is a graduate of Campbell University School of Law in Raleigh, North Carolina. Prior to law school, Jessica attended the University of North Carolina at Chapel Hill where she received Bachelor's Degrees in both Public Policy and Political Science, along with a Music Minor. 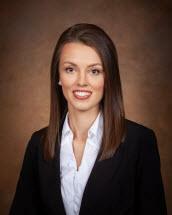 While at Campbell Law, Jessica was an active member of her school's national award winning Mock Trial Team. She was also the Director of the Pro Bono Council during her final year at Campbell Law. Jessica has a strong background in advocacy and received a 2018 Outstanding Advocate Award at the National Trial Conference Regionals, designating her as a Top 10 Student Advocate in North Carolina, South Carolina, and Georgia. She was later inducted into the Order of Barrister's, a national organization recognizing outstanding achievement in oral advocacy. Jessica is proud to have grown up in Four Oaks, North Carolina and to return to the Johnston and Sampson County areas to practice law.